Micro irrigation systems are wonderful for watering gardens and plants while saving money. Drip irrigation allows you to water directly to the source where it needs to be and not waste water that may evaporate into the heat. Ideal for arid climates, dripper irrigation systems allow for water to be used most efficiently. Drip watering systems are relatively easy to set up for garden watering. You can simply use a garden hose spigot as the water source for your water drip system. Attach an automatic timer to the water hose faucet. From the timer, connect a 3-in-1 regulator, filter and adapter that will allow for connection to sprinkler drip line. 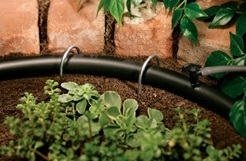 Use supply tubing attached to a drip manifold to run from the hose faucet to where you need to water. Once your supply line has reached your garden and plant areas, use tubing tees to route your drip tubing to areas where you plan to water. You can also use porous soaker tubing that allows water to seep directly into the ground. You may also use drip irrigation tube with pre-drilled holes. If you are using conventional irrigation drip tubing, you will need a punch gun or hole punch tool to make holes for water emitters or drippers. Using barbed couplings, attach micro sprayers or mini sprinklers in the holes you punch or in the pre-drilled holes. Before testing your new dripping irrigation system, flush all the lines to make sure no debris or tube fragments are left inside. Once you have flushed your micro drip system, you can cap the ends with barbed end plugs to maintain a constant pressure. From your drip system timer on the garden hose faucet, test all the micro sprinklers or water drippers to make sure they are watering where you need them and that they are not clogged. You can then set your watering times, durations and intervals on your automatic timer. Your gardens and plants will get the water they need and you will save money and conserve water with a micro sprinkler system. Your garden watering can be easy and hassle-free with an automatic drip sprinkler system.